It’s a scary thought realising how much time has passed in your own life. Through your childhood and your teens your life seems endless with possibility. And then as you enter your twenties although you are still young you sometimes receive a bit of a shock as to how much time has passed since certain events. What may have just seemed like just a short while ago actually turns out to be several years ago when you add up the dates. 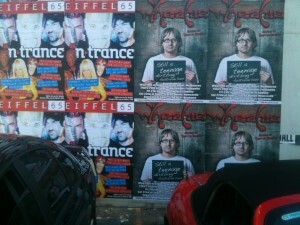 For me I got a mild shock when I saw this street poster for some upcoming shows in the Valley. Somehow enough time had passed that these moderately popular late 90’s groups had fallen into obscurity and then re-emerged as part of the nostalgia circuit. Had it really been that long since Wheatus annoyed us with infectiously bland hit song “Teenage Dirtbag”? Apparently it had, 12 long years in fact. A quick look at at the big tours and shows confirmed that 90’s nostalgia is in full swing. New Kids on the Block and the Backstreet Boys joined for an extended tour, Aqua and East 17 played the Hi-Fi bar and pop-punksters Bodyjar are touring this month playing their 1998 record “No Touch Red” in full. Its inescapable. For us that grew up in the 1990’s, our music is clearly “retro”. But as time passes anything new will inevitably become retro. I look forward to the Skrillex 2025 comeback tour. Can’t beleve I hve only just read this now!